Back in the steelhead-fishing hey-day of the early seventies, I spent a lot more time fishing our Northwest Rivers than I spent on the salt water. I was addicted to winter steelhead fishing, sometimes quitting my job with a local timber company just after Thanksgiving, fishing every day the rivers were in shape for the next four months, and looking for work again when April rolled around. Life was good, but I did, of course, experience hot streaks and cold spells over the course of every season. One of those cold streaks was a week or so when I hooked and lost ten fish in a row (on bait), and I was about to go nuts trying to figure out why. Out of desperation, I switched from one brand of hook to another. Although the two were the same size and looked nearly identical at first glance, there were minute differences in their gap and point length. 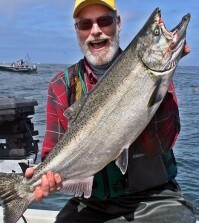 According to my winter steelhead journal, I landed 11 of the next 12 fish I hooked. That hook-change experience of more than 40 years ago may be an extreme example, and there were more than likely other factors that contributed to my sudden change of fishing fortune, but the episode illustrates the point that choosing the right hook for the situation can sometimes make all the difference between fishing success and failure. 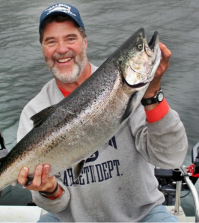 There weren’t all that many choices when I went looking for a different steelhead hook back in the seventies, but the one I settled on, Mustad’s 92553 octopus hook, is still my favorite bait hook for most of my river steelhead and saltwater salmon fishing. That doesn’t mean, however, that I use the same size, style and number of hooks for every situation or fishing technique I employ during the course of a day on the water. There’s a lot to consider when it comes to choosing the right hook for the job. 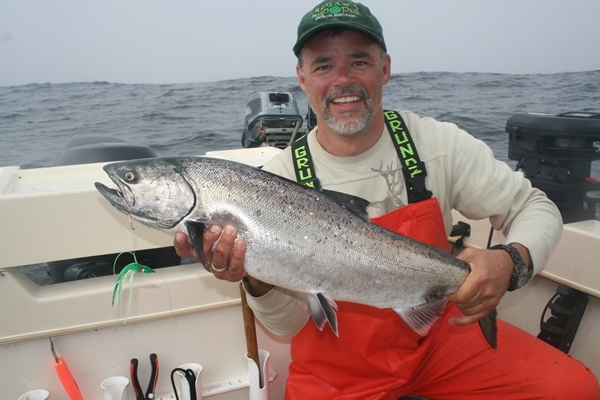 I think most salmon anglers agree that it’s not a bad idea to use smaller hooks with three- or four-inch herring or anchovy baits and larger hooks with seven- or eight-inch baits, but I have to admit that I was a rather late convert to that philosophy. Believing that “bigger is better” applied to nearly everything, I almost always used a pair of size 4/0 or 5/0 hooks at the end of my mooching leaders, whether I was using my usual green-label or blue-label herring or downsizing to red-label or smaller baits. I really don’t believe that salmon have some sort of instinctive fear of little, pointy wire things sticking out of their food, and it seemed that the more exposed the business end of a hook, the better the chance that it would stick into a salmon’s jaw. 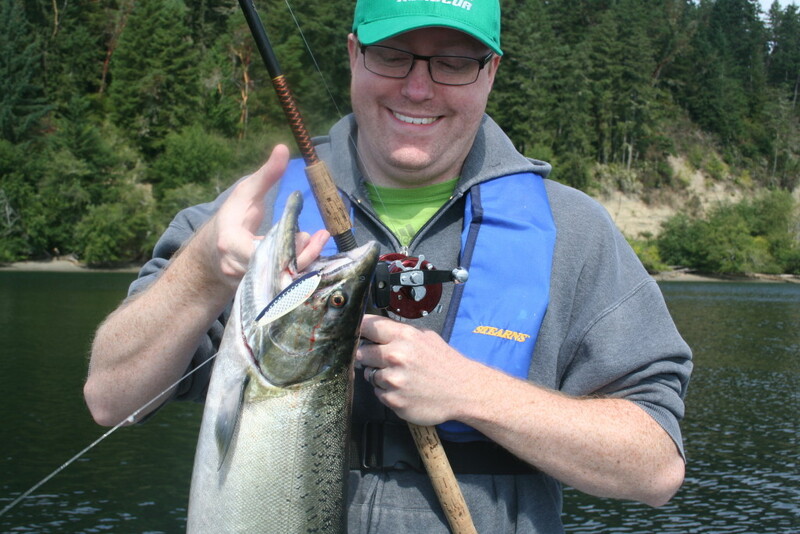 Well, I still think salmon have little or no fear of hooks, but I’ve finally wised-up to the fact that a pair of larger, heavier hooks in a small bait will more often than not dampen and slow that bait’s action, making it less attractive and less effective down there where it counts. I still use my 4/0 and 5/0 hook rigs with my old stand-by green-label herring, even sometimes when I’m mooching blue-label baits, but when orange-label herring or anchovy baits in a helmet are the day’s main course, they’re served on a pair of 1/0’s or 2/0’s. I specifically mentioned mooching in that last sentence because I often use a different hook size when I’m mooching than when I’m trolling. When mooching I go smaller, trolling I go larger. 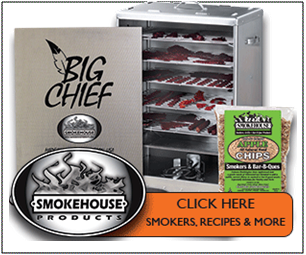 That’s because when mooching you usually want to allow salmon—especially chinook—a little time to hit, mouth and inhale the bait, and a smaller hook tends to go down a little easier and a little farther than a bigger one. Trolling strikes, on the other hand, are usually an all-or-nothing proposition—you either hook ‘em or you don’t—and a slightly larger hook, jutting out just a little farther from the side of the bait, might make the difference between a hook-up or a miss. Assuming I’m using the same size bait for both methods, I usually go one hook size larger for trolling. Many salmon anglers judge the quality of a fishing lure by the quality of the hook that’s dangling off its rear-end, and that’s often a good strategy, but not always. Without pointing fingers at any specific spoons, spinners, jigs or plugs, I’ll just say that a few of the more popular ones are great fish-foolers but carry hooks that, in my opinion, aren’t right for the job. In most of those cases, the hooks are a little too small. I like the gap of a hook to be at least as wide as the lure width, and slightly wider is even better, so if I buy a spoon or metal jig that’s, let’s say, half an inch wide and is equipped with a size 1 or 1/0 hook, I’ll remove that hook and replace it with a size 2/0 siwash, which has a gap of about five-eighths of an inch. Over the course of a season, I’m convinced that the slightly wider bite of the larger hook results in a few more solid hook-ups and a few more fish in the box than I would have gotten with a smaller hook. 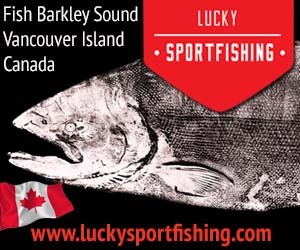 Sometimes those spoons, spinners and jigs come out of the package adorned with treble hooks, and they usually go directly into the garbage can, even though there are still a few places, mostly in freshwater, where it’s legal to use them for salmon. 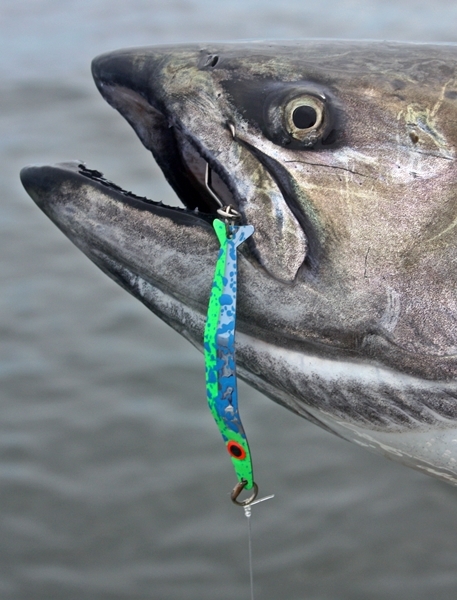 There are still a lot of anglers out there who would prefer to use trebles on their salmon lures if they could, but more and more Northwesterners have come to accept—even prefer—single-point hooks. How often have you heard someone say that they seem to hook-up on more strikes when using treble hooks but land a higher percentage of hooked fish when using single-point hooks? Well, there’s something to that, and it’s probably because with trebles you’re more likely to sink a hook point (or two) into the outside of a salmon’s mouth as the lure is inhaled, so the hook point is aimed back at the fish rather than toward you. When you set the hook and as you’re playing a fish that’s hooked “backwards,” you’re actually pulling the hook back out of the fish’s mouth. A single hook, on the other hand, is more likely to be taken completely into the mouth, so under tension the hook point is pulled toward you and into solid fish flesh. While most any siwash-style single hook is better than most any treble on a wide range of salmon lures, I’ve settled on a favorite siwash in recent years. I think it was about 2011 when I discovered that the folks at Silver Horde/Gold Star were rigging one of my favorite trolling spoons, the Coho Killer, with Matzuo’s sickle-style siwashes. 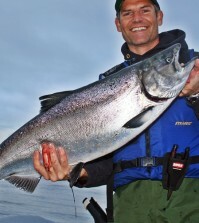 During the first week of the early coastal chinook season that year, the kings were in close to the beach feeding on small anchovies, and trolling Coho Killers was as close to a sure-thing as you’ll ever see in salmon fishing. The only “problem” was that there were lots of sub-legal Chinook and even more Coho (which weren’t legal to keep) mixed in with the keeper kings, so my fishing partner and I were hooking a half-dozen or more fish for every one we put in the box. 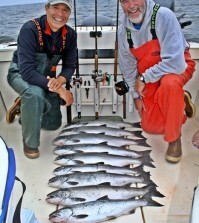 One day I decided to keep an accurate count, and the two of us hooked 23 salmon and brought 22 of them to the boat! The only fish we lost was a behemoth that peeled off about 100 yards of line on the strike, tangled me up in a big ball of kelp and eventually broke off. Every one of those fish was hooked on those Matzuo sickle hooks, fished barbless on the tail end of a Coho Killer, and I’ve seen no reason to use any other siwash since. While I may not be crazy about hooks with three points, there are times when I prefer a pair of single hooks over just one. Yes, as I mentioned earlier, I use a pair of octopus-style hooks, tied in tandem, whenever I fish whole or plug-cut herring baits or whole anchovies. I use the same tandem-hook rig when trolling hoochies (plastic squid), Ace Hi Flies and the like behind a flasher. I like fairly small, size 1 to 2/0 hooks, and tie them two to three inches apart, depending on the size of the hoochie or fly. The top hook should be right behind the head of the lure, and it’s often necessary to add a couple of small beads or a short length of plastic tubing above the hook to achieve that placement. The trailing hook should be tied far enough back to hang slightly behind the tail-end of the lure. Some anglers prefer a single siwash hook on a bead chain for their hoochies and flies, but I tend to get fewer strikes and land fewer of my hook-ups this way, so have pretty much given up on that rig. I think the heavier hook and addition of the bead swivel might dampen the action that’s imparted to the lure by the flasher, or at least that’s what I’ve convinced myself. Perhaps more importantly, I figure that having two hook points back there might just improve my odds of hooking up. There is one type of “slider” lure that I do rig with a siwash hook on a bead chain, and that’s a Brad’s Cut Plug. If you’ve ever used these little plastic plug-cut herring imitations, you’ve probably noticed that the “directions” recommend both a tandem-hook and siwash/bead chain hook option, and I’ve rigged ‘em both ways dozens of times. I would estimate that my hook-up-to-dead-fish ratio is about twice as good with the single siwash than with the tandem-hook rig. I think it’s because the siwash hangs farther back, completely clear of the lure and, once hooked, a fish has less leverage to pry the hook from its jaw. As mentioned earlier with spoons, jigs and other lures, too large a hook is better than too small a hook. Whatever the fishing situation and whether you choose big hooks, small hooks, singles or trebles, one hook or two, sharp hooks are always going to put more salmon in your fish box than dull hooks. Most of the salmon hooks on the market today come out of the package sharp and ready to fish, but don’t take it for granted. Look ‘em over before you tie them onto a leader or add them to the tail-end of a lure. Keep a good hook file with you at all times and don’t be shy about using it often. 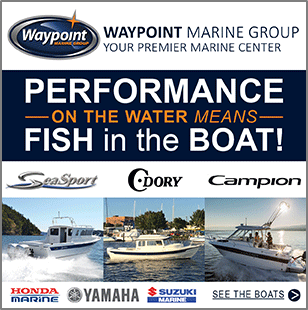 Check your hook points regularly, especially after each time you hook or land a fish. I like a three-sided point, so that there are three flat sides and three “razor” edges to cut through flesh, bone and cartilage smoothly. Also, whenever you play a good fish for a while or hang up on the bottom, be sure to look the entire hook over thoroughly. Light-wire salmon hooks will sometimes bend open, or you may break or bend the point, either of which may mean a lost fish next time you hook-up. 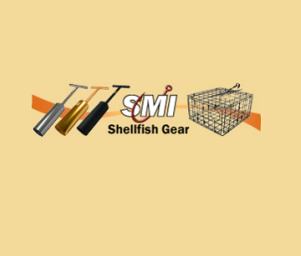 In short, take good care of your salmon hooks and they’ll take good care of you.